Definition - What does Utthita Ashwa Sanchalanasana mean? Utthita ashwa sanchalanasana is a yoga pose that stretches the spine, opens the chest and strengthens the legs. 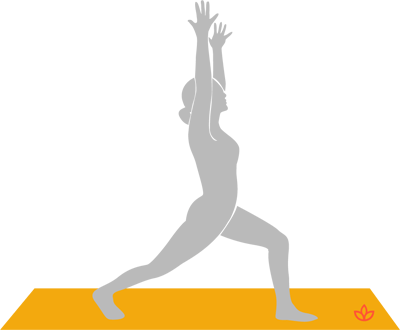 This pose is one of the 12 poses of the traditional Hatha yoga Sun Salutation sequence. The name of this pose comes from the Sanskrit words utthita, meaning "raised," ashwa sanchalan, meaning "horse riding" or "lunge," and asana, meaning "pose." From uttanasana, or standing forward bend, one foot steps three to four feet back, placing the ball of the foot on the mat. The front knee bends, creating a right angle in the knee, foot pointing forward, and knee above the ankle. The back leg is straight, pressing the knee upward and the heel backward. The torso leans forward onto the front thigh, hands press into the mat. The gaze is pointing forward. In order to deepen the asana, one can lift the torso upright and raise the arms up toward the ceiling or place the hands in anjali mudra in front of the chest. Utthita ashwa sanchalanasana is commonly referred to as high lunge pose in English. Practicing this pose improves stability, concentration, core awareness and balance. In Sun Salutation each pose from the sequence energizes one of the seven chakras, from root to crown. Utthita ashwa sanchalanasana works on the ajna (third eye chakra), which is responsible for clear perception, intuition and ability to follow one's own Truth. This pose also stimulates the sacral chakra and opens the heart chakra. In order to make this pose a little easier, one can place yoga blocks under the hands or lower the back knee to the floor. At the beginning, one can keep the hands on the mat, then later place them on the front thigh and then raise them up toward the ceiling.